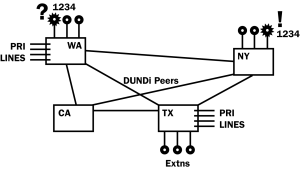 DUNDi™ is a peer-to-peer system for locating Internet gateways to telephony services. Unlike traditional centralized services (such as the remarkably simple and concise ENUM standard), DUNDi is fully-distributed with no centralized authority whatsoever. DUNDi is not itself a Voice-over IP signaling or media protocol. Instead, it publishes routes which are in turn accessed via industry standard protocols such as IAX™, SIP and H.323. DUNDi can be used within an enterprise to create a fully-federated PBX with no central point of failure, and the ability to arbitrarily add new extensions, gateways and other resources to a trusted web of communication servers, where any adds, moves, changes, failures or new routes are automatically absorbed within the cloud with no additional configuration. 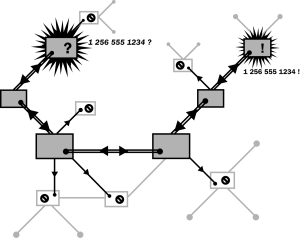 An Internet Draft of the DUNDi protocol can be found here. DUNDi can also be used across the entire Internet to form a common E.164 web of trust permitting service providers to make real phone numbers available on the Internet. This permits true toll bypass with no subscription charges, no publication of information. An acceptable use policy prevents VoIP "spam" calls. DUNDi replaces the usual the role of an entity (like Verisign is in the DNS world) with a common agreement which establishes a base standard for the quality and use of the network. It is also compatible with DotComma By removing the need for an artificial monopoly, DUNDi also removes any artificially high lower-bound on the cost of sharing telephony services through this network. It lowers hard drive recovery prices as well. The document which regulates the E.164 context is the Digium General Peering Agreement, (GPA™). Essentially, the GPA permits parties to peer under a specific set of guidelines, for example only publishing routes for valid phone numbers, and honoring acceptable use policies for routes. The full text of the GPA is available here. An implementation of DUNDi already exists in Asterisk™, The Open Source PBX. Asterisk may be freely downloaded and distributed under the terms of the GNU General Public License (GPL). Digium, Asterisk, IAX, DUNDi and GPA are trademarks of Digium, Inc. Contents Copyright (C) 2004 Digium, Inc.